Born in 1988 in Halle, Belgium. Nick Defour is as fresh as the morning sun. The performances in his palette define a pure and direct message, while peacefully referring to a significant moment. 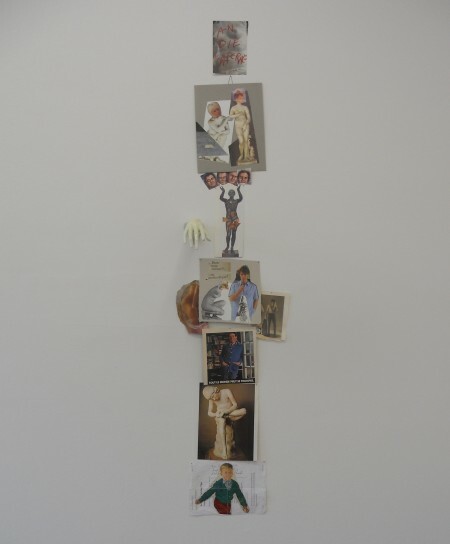 His installations are veritable relics conceived in the selfsame spirit and intimately interwoven in his oeuvre. In the back space there is a small towel with a greek motif. On it lay a fish with a rope bound around its tail. On the staircase hangs Nick’s homemade ‘patat nimmer weinen’ jacket with his poetry album ‘Poëzie Poes Pose’ in the pocket. 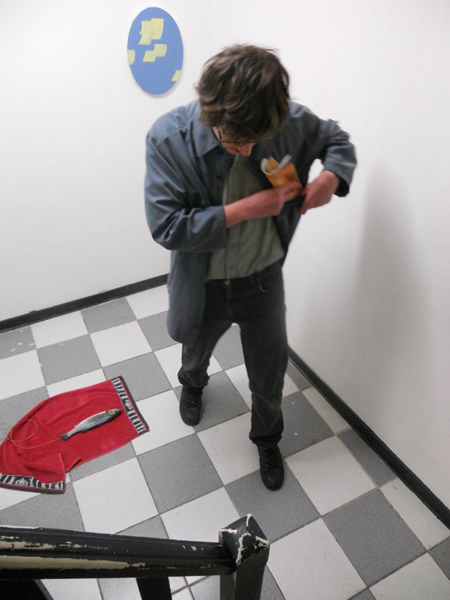 For the performance he makes four rounds in the gallery while dragging the fish on the rope behind him and then afterwards putting it back on the towel, putting on the jacket, going to a painting and reciting one of his poems to the painting. This is repeated four more times with the fish, each time with him putting on the jacket and reciting a poem, taking off the jacket again and dragging the fish, until the fish and the rope get stuck on something in the gallery, at which point he takes the towel, places it underneath the current position of the fish, and stops. 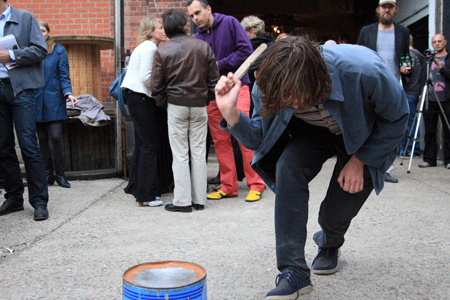 Picking up a previously positioned cobblestone from the gallery floor and starting off on a sojourn into the street while repeatedly chanting HINTER DEN BERGEN, DAS TAL, the people follow on behind him. 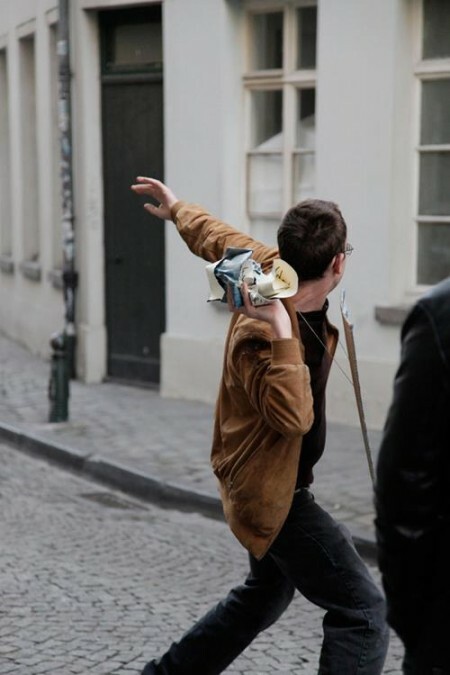 Once in the street, Nick throws a large paper aeroplane into the air and begins to recite a Flemish poem he composed, while performing various actions in the street, including crashing the stone at a key moment. 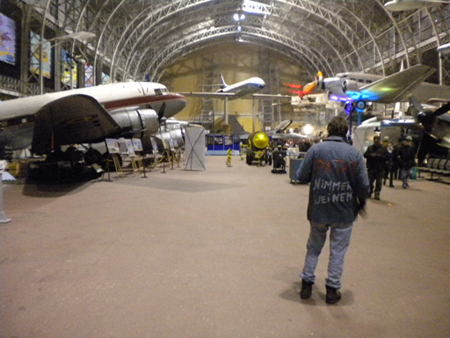 The performance concludes with Nick walking off into the distance and disappearing into the night. 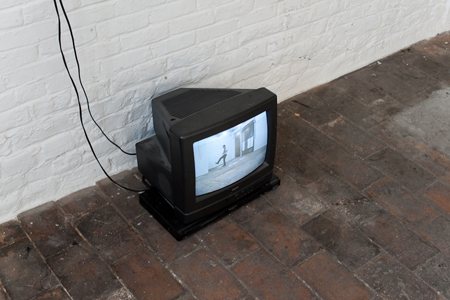 Placed against the wall is a monitor, on top of which is a metronome, a lump of charcoal and a block of marble. The performance begins when Nick approaches the monitor and starts-up a video. He straddles the monitor and faces the wall. He is to be seen on the video reciting by heart from a text that is split into syllables; the video is in three parts. During the first part, Nick quotes a sentence from “L’Etranger” by Albert Camus. To the rhythm of the text he draws large circles on the wall with the lump of charcoal, each new circle drawn on top of the one before. Thereafter is an equally long section of video with no image on the screen, at which point he stares at the thick circle. 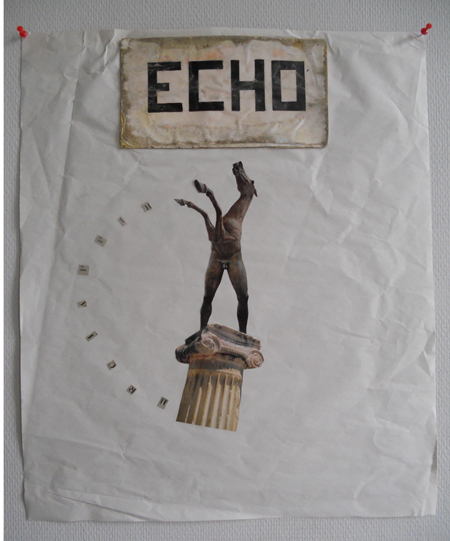 When the second part of the video begins, he recites part of a poem by Charles Bukowski while striking the wall in the centre of the circle with the block of marble, to the beat of the text. After this there is again no image on the screen until the third part of the video starts up, when he once again recites a piece out of “L’Etranger”. Meanwhile, Nick looks at the hole that he had banged in the wall. After the third part of the video he steps away from the monitor and starts-up the metronome. 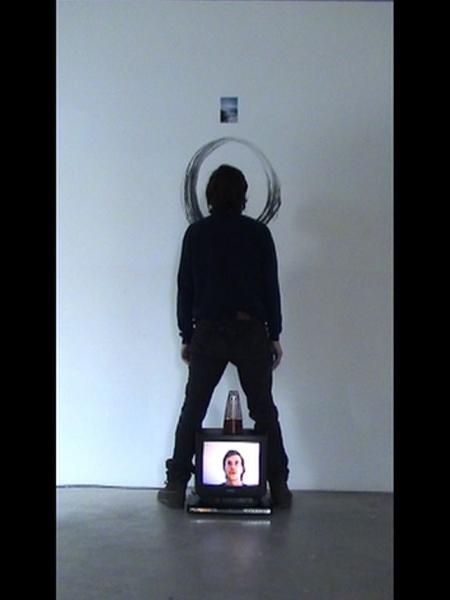 The looped video, the ticking metronome, the hole in the wall, the circle, the charcoal and the block of marble remain in place afterwards, as an installation. 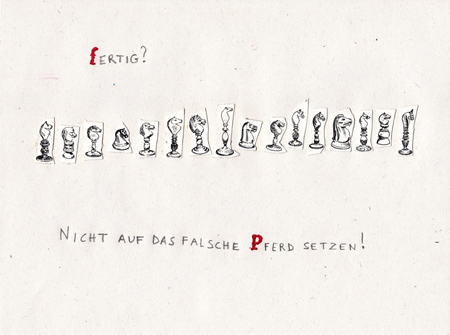 A framed sheet of paper with pencilled text and cutout drawings of chess horses. 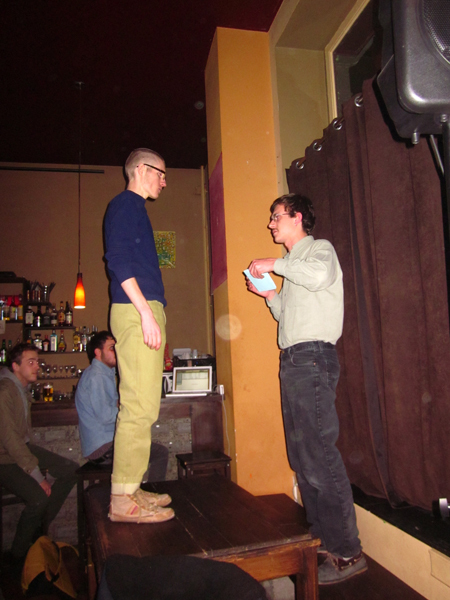 This performance was specifically made to be performed at a café on a certain date and at a precise hour. 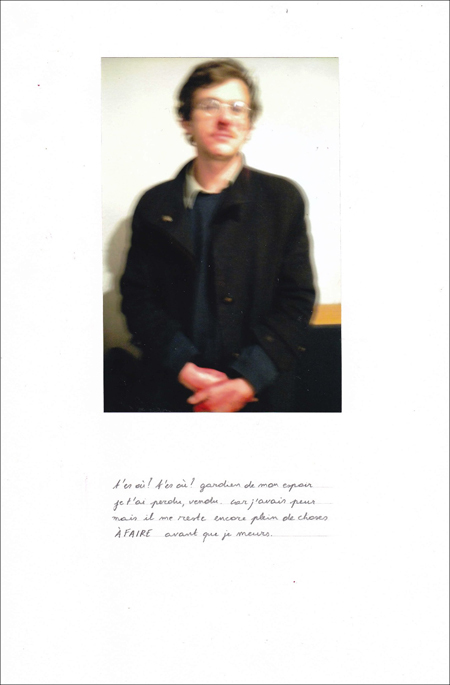 It was announced by way of 100 flyers signed by the artist that were distributed in Brussels. Nick steps onto a bench and his counterpart steps onto a table. Nick loudly declaims: “ALLEEN GOD WEET OF DE DICHTER NU DRINKT OF NIET”. Thereafter he hands his counterpart a paper with his own poem handwritten on it. He reads it aloud while Nick looks directly at him. Afterwards he gives the paper back to Nick and both men step down from their respective stages. 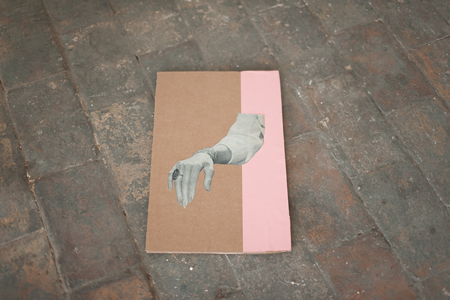 The performance consists of the following elements: a poster, a clock (without hands but still ticking), and some cardboard boxes that formerly contained wine. The poster and the clock are attached to the wall. Nick stands in front of these, on top of the empty cardboard boxes. 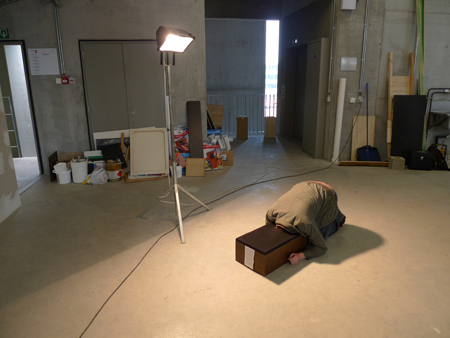 As Nick fetches a cardboard box and stands on it until it crushes, he repeats the text “ALLES WAS GESCHIEHT, GESCHIEHT HEUTE”. 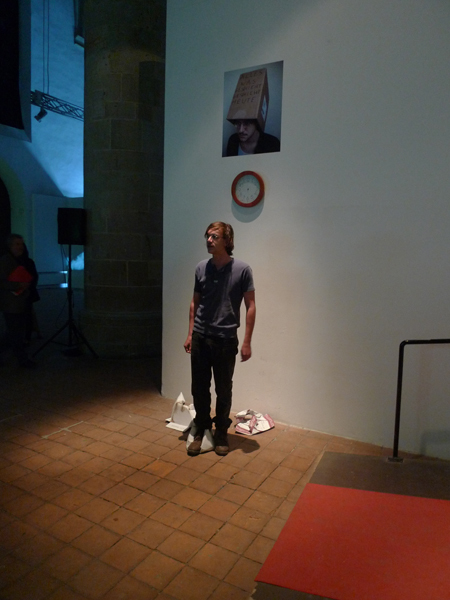 After the performance, the poster, clock and cardboard boxes remain in place as an installation. Initially intended as a ‘constant performance’, Nick began wearing a jacket bearing the inscription PATAT, NIMMER WEINEN. This work received its definitive form during a visit to the Army Museum’s anniversary celebration in Brussels. Nick stands on a strip of carpet with a block of marble in his hands. 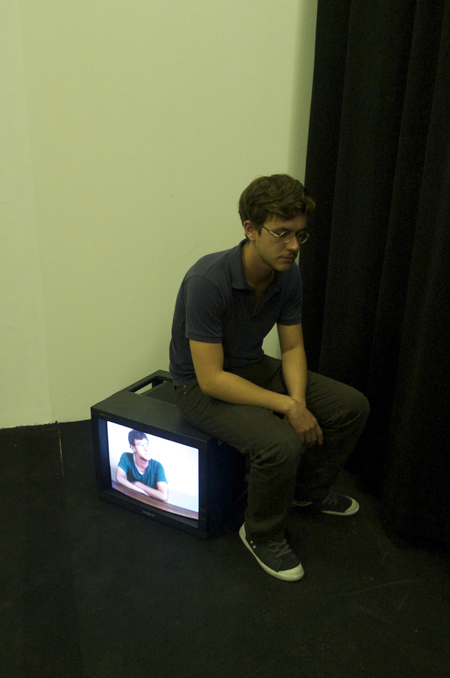 Placed in front of him is a monitor on which the video MEST AM TRISTE is playing. Next to him hangs a poster of FORELMAN. 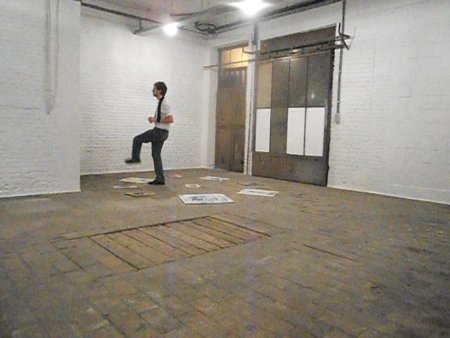 The performance begins when Nick picks up the block of marble from the carpet and recites the text “nog altijd Nick Defour hier” in different rhythms and at different volumes. When the video begins he lets the block of marble fall to the ground. 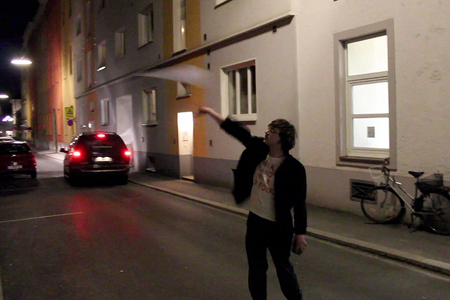 In the video, Nick is seen pronouncing the text KUNST WET GEBEUREN AM FREUDE EN AM TRISTE, MEST AM TRISTE. When the video ends he picks up the block of marble and begins the performance anew. Nick sits on top of a monitor on which he appears seated at a table, looking around, until he (this on-screen version of himself) finally looks up and asks “Ja maar, ben je serieus?” The live version of himself answers that question with “Ja, ik ben serieus.” The live Nick then stands up and leaves the room. 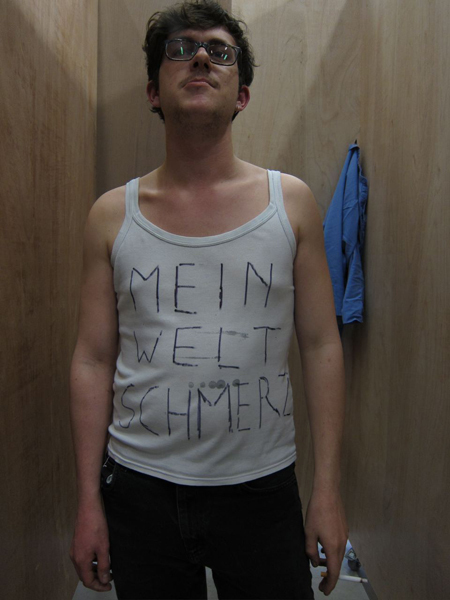 A vest onto which MEIN WELT SCHMERZ is handwritten in marker pen, hangs on a nail in a corner. Nick approaches the corner, takes off his shirt, lifts the vest off the nail and puts it on. 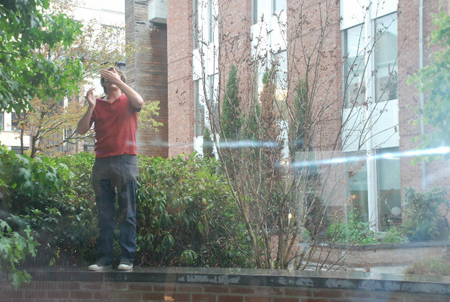 Next, he takes a cigarette out of his pocket, lights it and smokes it while looking straight ahead. When the cigarette is finished, he crushes it underfoot, takes off the vest and puts the shirt back on. He repeats this activity a multitude of times, with a short pause in-between of the same length of time as it took to smoke the cigarette. A heap of cigarette butts forms on the floor and is then left behind. A loudspeaker lays on its side on the floor. A hole has been made in the top of it and a page from “The Idiot” by Fyodor Dostoyevski, is fixed to its side. The scene is spotlit by a lamp on a tall tripod fixture. Nick goes up to the loudspeaker, kneels down, sticks his head completely inside it and recites the text from ‘Decades’ by Joy Division. He then takes his head out of the loudspeaker and steps away. 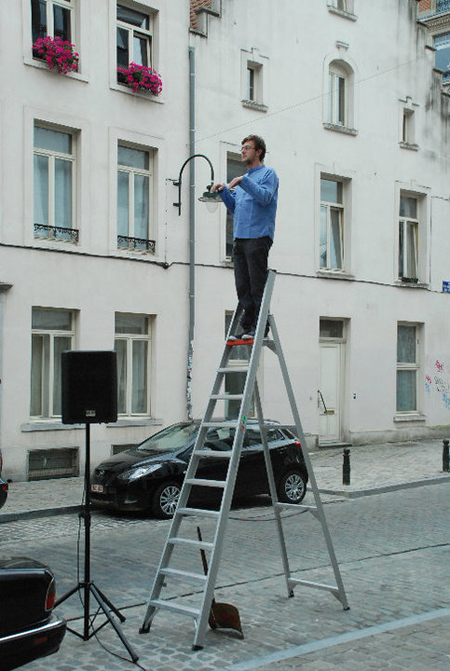 Nick stands on a tall ladder striking a watchman’s pose. 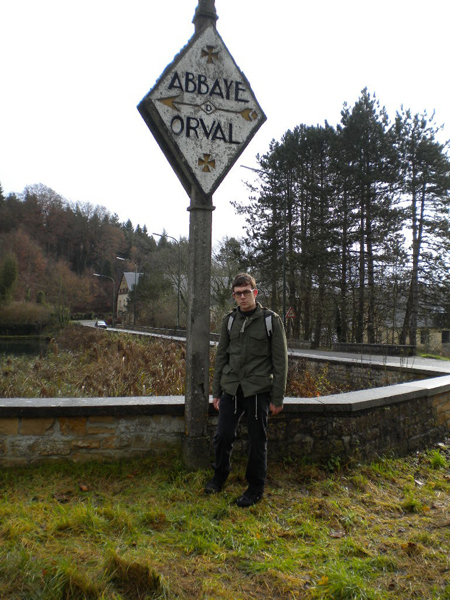 During an entire weekend, Nick played the character of ‘Bart’ in the town of Orval, Belgium (home of a Trappist brewery). 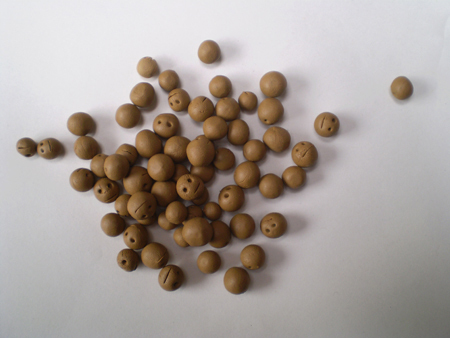 Hand-rolled and oven-baked balls of clay (circa 0.5cm in diameter) that Nick freely distributes at will.